Young Eastern Phoebes getting ready to fly on their own. 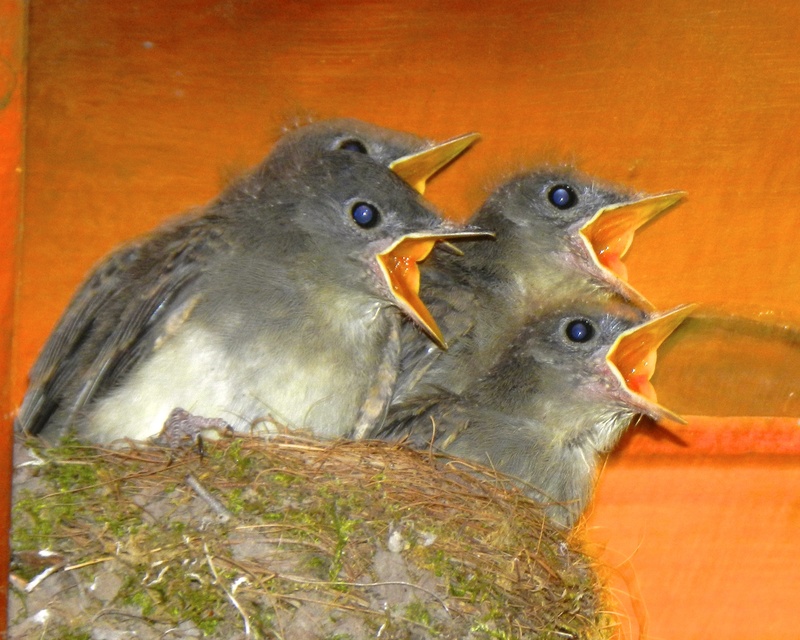 Last spring when we returned from our “Mud Season” trip out west on Old Route 66, we discovered a pair of Eastern Phoebes had built a nest in the rafters of our covered front porch. Actually it was more of a realization than a discovery as it was located just outside our bedroom window. It was hard to miss the babies incessant chirping as the four small hatchlings competed for their parents attention. Not unlike small children, they were dependent on their mom and dad to meet all their needs. In fact when they were in the nest, the parents would spend the better part of the day hunting for food, predigesting it and then feeding the fast growing youngsters. It wasn’t long after we learned of the nest that I took this photograph and only a day or two later that they left. After it was clear that they would not be returning to the nest, we removed it and cleaned the area to get rid of any parasites that may have taken up residence. Darned if we didn’t find a new nest this spring in exactly the same spot, this time with three eggs not yet hatched. We watched as the parents took turns guarding the nest and finding material to reinforce it. The eggs all hatched and it wasn’t long before I saw the fledglings out of the nest, two standing on the rafter and the third hoping around on the deck. Soon they were gone, although I did not see them go. I got to thinking that this process with the bird families is not unlike what happens, or should happen, with human families, although in a much shorter time frame. Our job as parents is to provide our offspring with a loving, safe home where they can grow strong. We need to feed them and teach them what they need to know to take care of themselves. Then when they finish their schooling, our kids should understand that it is their responsibility to make a home for themselves. Young birds are forced to learn this very quickly . They are not given the option to stay or return to the nest because there is no nest to which they can return. In recent years, the number of young people who stay in their childhood homes, or return to them when things become difficult, has exploded. I have heard the term entitled dependence use to describe this phenomenon . I believe that entitled dependence is not fair to either the parents or the young people. We do our otherwise healthy and competent children no favor by not holding them accountable for their own care. We need to start early by giving them increased responsibility for their own care. A nominal allowance tied to the completion of household chores and later a part-time and/or summer job can help to reinforce the connection. I used to have a boss that always said, “You get what you expect”. The adult birds expect their young to leave the nest and so should we expect our children to learn to fly on their own. We should give them the necessary tools and then let them soar. This entry was tagged bird nests, birds, entitled dependence, fledging, gaining independence, increased responsibility, learning to fly on their own, returning to the nest. Bookmark the permalink.